Favorite microphone of closed captioning professionals and students. Originally intended for musicians the Sennheiser ME 3-II delivers superb accuracy and noise cancellation and is considered one of the first Cadillac microphones for use with speech recognition. The ME 3-II has a comfortable behind the neck wearing style (think reverse eyeglasses) and can be worn for extended periods of time. The ME 3-II has no speakers and requires an appropriate USB soundcard. 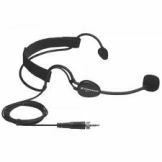 The Sennheiser is rugged, light/comfortable and extremely high quality for both music and speech recognition software. Because this microphone was originally designed for vocalists, it features unheard of noise rejection. To test the Sennheiser's noise cancellation properties we played rock music at 120 decibels which is 30 decibels above safe human listening levels. In other words, live concert levels. We then placed the Sennheiser Headset microphone 1 inch away from the speaker. The microphone rejected all external sounds except for our speaking voice which even we couldn't hear because the music was so loud. You can't ask for better noise cancellation than that. 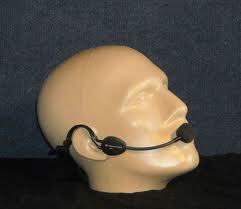 This microphone simply doesn't hear anything but your voice and it can even be worn under a cowboy hat! Note that this microphone does not include playback speakers, which are unnecessary for speech recognition. Please note that the Sennheiser Headset microphone draws more voltage than the average microphone and is not ideally suited for use with integrated sound cards or even Sound Blaster PCI cards. If you're planning on using the Sennheiser Headset microphone for speech recognition we additionally recommend the Andrea Pure Audio MA (external soundcard). The Andrea Pure Audio MA (external soundcard) allows you to connect any computer microphone and convert it to a USB audio device. This ensures high quality audio on any operating system. 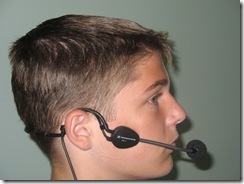 Used for speech recognition applications, internet telephony and all computer audio applications.